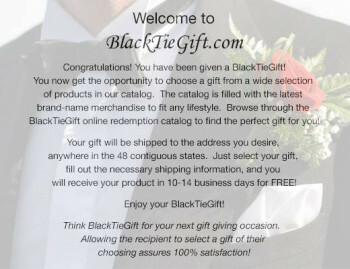 BlackTieGift is a multiple selection gift catalog for any Black Tie event. Black Tie events can range from groomsmen/wedding gifts to charity/organization dinner events. 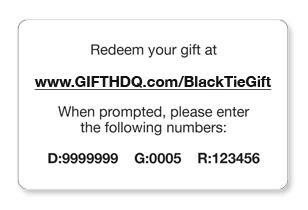 BlackTieGift offers the fastest and easiest gift for any Black Tie occasion. The buying process takes only 5 minutes and the recipient is able to select an item that they desire. The recipients are completely unaware of how much the customer has spent so for example the groom could get his Best Man a more expensive catalog. Take the headache out of trying to pick out the perfect gift and instead have BlackTieGift handle it which assures 100% satisfaction guaranteed. BlackTieGift offers 5 different merchandise collections, ranging from $35 to $150. The collections are filled with the latest brand-name merchandise to fit any lifestyle. BlackTieGift also includes no extra cost for shipping and handling to the recipient. If the recipient is in anyway unsatisfied with the gift for any reason, BlackTieGift will allow the recipient to exchange it for any other gift in that catalog at no cost. We will pick up the unsatisfactory item at our expense and replace the item. A true 100% unconditional satisfaction guarantee. BlackTieGift insists that you don't need to waste time worrying about what to get your groomsmen. We understand that wedding time can be stressful and hectic, so get something checked off your list fast and convenient with BlackTieGift. Let them make the Choice!